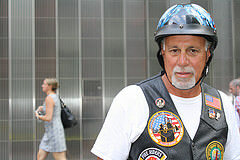 In honor of those who were lost during the September 11th, 2001 attack 13 years ago, hundreds of motorcyclists rode the streets of Manhattan Thursday morning from Rescue 1 firehouse to the site of the fallen towers. 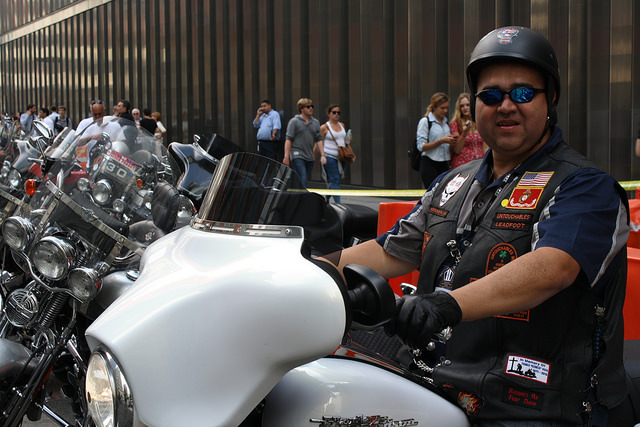 “I’ve never seen so many [bikers],” said John Mora, 43, of Hackensack, N.J.
A first-year participant, Mora joined representatives of both the FDNY and the NYPD along with Gov. Andrew Cuomo on a ride from the Rescue 1 firehouse in Midtown to the memorial site. None of the 11 firefighters from Rescue 1 who worked on September 11th survived. Mora explained that he was invited to join the ride by New York City’s Renegade Pigs Motorcycle Club, a non-profit organization that hosts charity events in support of law enforcement and their families. “My club is the Untouchables Motorcycle Club of New Jersey and we’re also a law enforcement club of first responders,” he said. “I felt that on this day, 9/11, that we should pay respect. It was also Mora’s birthday. Mora saw the attack first-hand from the roof of the hospital where he worked in New Jersey in 2001. “It doesn’t matter if you have any relatives or anything, anybody who was here and saw – it affected them,” he said. Army veteran, Brian Sommers, 46, of Albany, N.Y., also expressed his gratitude in the bike ride with the Combat Veterans Motorcycle Association, which is comprised of veterans from all branches of the United States Armed Forces. Sommers and his friends are full-time military veterans who have been deployed in combat and were asked to join the ride by other friends involved. Robert Helfant, 61 of Virginia Beach, Va. and a retired firefighter, also rode for the first time, having biked from Virginia yesterday. With an American Flag bandana covering his head, he also donned a handful of patriotic pins and patches on his black vest, including a Fallen Heroes patch showcasing the towers and first responders. “I have a friend that’s a retired FDNY and he was going on this ride and I asked if I could come along and they invited me. I came up from Virginia and I’m leaving now,” Helfant said. Born and raised on Long Island, N.Y., Helfant moved to Virginia when he was 16-years-old and worked there as a firefighter for almost 30 years. “[The ride] was extremely rewarding,” Helfant said. On September 11th, 2001 Helfant was actually working at the Pentagon in Washington, D.C., waiting to attend a staff meeting. He was working a fire-training session as an instructor. As part of the FEMA taskforce, he responded to the Pentagon to help facilitate rescues. That particular mission had about 80 personnel that responded, Helfant said. But the turnout for the ride lifted his spirits. “Seeing all the citizens standing on the side of the street, you know applauding and taking pictures and giving us a thumbs-up, it doesn’t get any better than that,” he said.